Expand your skills in the rapidly growing field of laser dentistry! 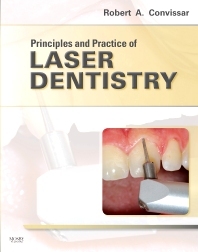 Principles and Practice of Laser Dentistry uses a concise, evidence-based approach in describing protocols and procedures. Dr. Robert A. Convissar, a renowned lecturer on this subject, has assembled a diverse panel of international contributors; he’s also one of the first general dentists to use lasers in his practice. The book covers the history of lasers in dentistry and laser research, plus the use of lasers in periodontics, periodontal surgery, oral pathology, implantology, fixed and removable prosthetics, cosmetic procedures, endodontics, operative dentistry, pediatrics, orthodontics, and oral and maxillofacial surgery. Full-color images show the latest laser technology, surgical techniques, and key steps in patient treatment. Full-color photos and illustrations demonstrate surgical techniques and key teaching points. A Laser Fundamentals chapter describes the physics of lasers and the wavelengths that can produce better outcomes. Introducing Lasers into the Dental Practice chapter provides guidelines on investing in laser technology and in marketing this new procedure. Clinical Tip and Caution boxes include advice and alerts that can only be offered by a seasoned practitioner of 27 years.